After a decade spent flitting through historic eras, and switching up the action to suit each archetypal hero, the Assassin’s Creed series is changing its perspective. It’s looking at you. Assassin’s Creed Origins drew a new line in the sand for Ubisoft’s open-world behemoth. The series moved on from purely action-oriented sequences with self-contained outcomes, and became closer to a free-roaming RPG in the hunt for shiny loot. Bayek of Siwa quickly established himself as one of the most likeable and charismatic protagonists so far. It seemed as though Ubisoft had reached another creative plateau, one we expected to linger on for a while. 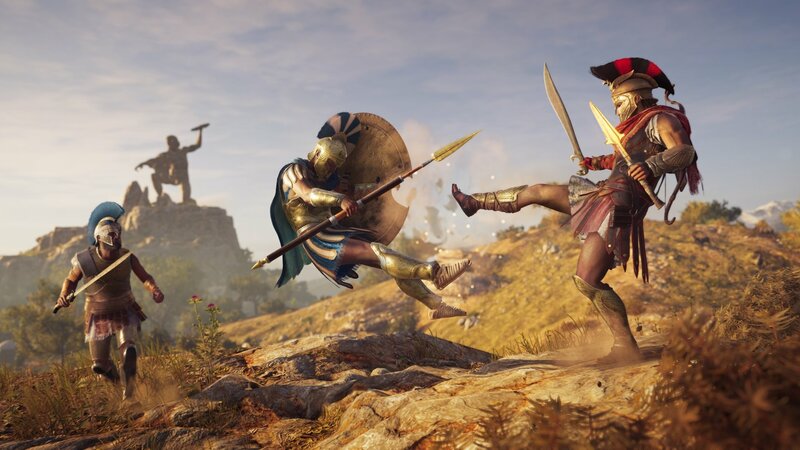 Surprisingly, Ubisoft is attempting something significantly new for Assassin’s Creed Odyssey to broaden the role-playing element. It’s handing over some of the decision-making to players, expanding conversation options in hopes of making the war between Athens and Sparta feel personal. While the fate of this latest historic playground is preordained, relationships between the characters, and strategies for missions, are guided by player choice. As with the E3 demo from June, our time with the game began after 20 hours or so into the story, with our chosen character, Kassandra, at Level 18. 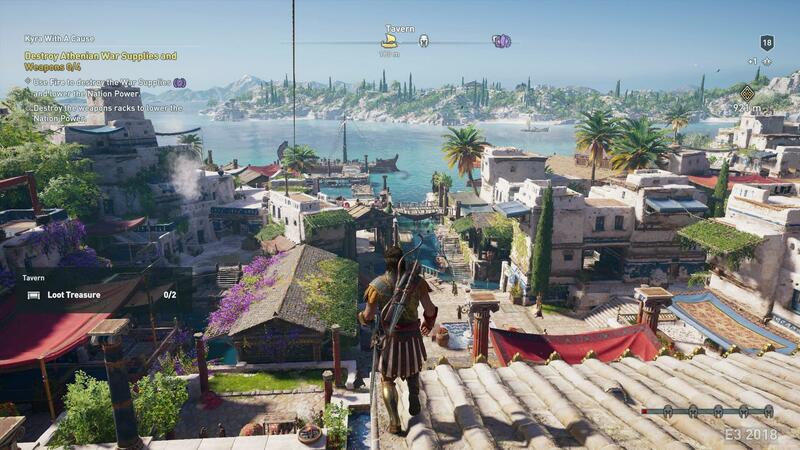 Unlike the E3 demo, Ubisoft gave AllGamers complete freedom for several hours, allowing us to explore the island of Delos and to figure out how this whole conversation-leading-to-consequence thing works in Assassin’s Creed Odyssey. Our initial point of contact on the island was the rebel leader Kyra, who served as our main sounding board. Before heading off to liaise with her, Kassandra’s companion Barnabas offered three options upon disembarking from our ship. For this arc of the story at least, it seemed that Barnabas was taking note of our decisions, because at the close of the mission, upon finally wrestling control of Delos from the Athenians, Barnabas merrily reminded Kassandra of her exploits, starting from an emphatic “We came to do a job, let’s do it” initiative, as opposed to choosing to relax and explore. We did toy around a little with conversation options afterward, asking Barnabas to repeat the mission objective, whereupon he began the whole introductory dialogue again before Kassandra interrupted with “the short version, please.” A nice touch. However, like most RPGs, lesser NPCs with something to say would repeat their dialogue if approached more than once. Diving back into the story, it turns out that a cruel Athenian officer called Podarkes is the primary target on Delos. Kyra is the person who most wants him dead – she watched him kill her mother when she was just a girl, barely escaping with her life. 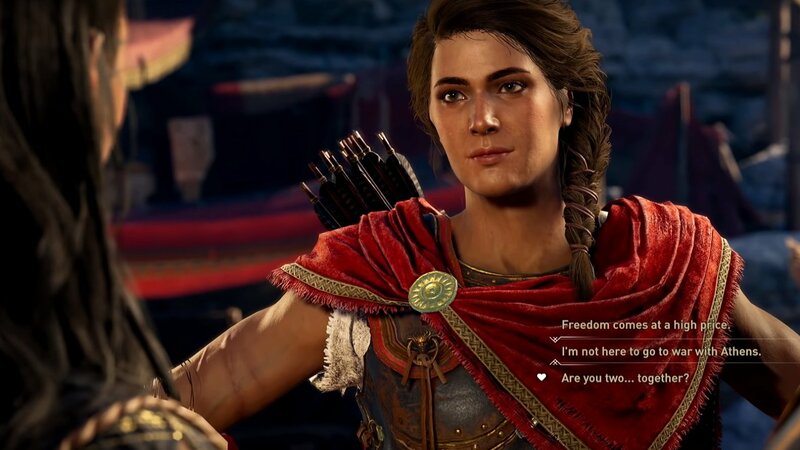 We’ve already seen that it’s possible to romance Kyra whether playing as Alexios or Kassandra, but it would appear that the rebel leader takes note of general behavior, not just willful responses of a seductive nature. We weren’t even trying to woo Kyra but wound up agreeing to her advances a further down the line. Mainly, we started out being cocky. Meeting the rebels for the first time we were challenged over our allegiance. Keen to make an impression we opted for Kassandra to announce, “I am a god in disguise”. We could’ve instead accused her men of being drunks, or simply been matter of fact, proclaiming, “I’m not a spy,” which would’ve been extremely boring. Somehow this was taken pretty well, and possibly turned out to be a smart move (if only we had any idea what we were doing). The mission also saw us lock horns to a degree with Kyra’s apparent (and rival) love interest, the Spartan commander Thaletas, who is rightly suspicious of his partner’s recent hire. After fighting by his side in an early stage of the mission, we were offered some time for reflection, and an option to assert “Everyone dies,” or, “War affects us all,” which contributes to Thaletas’ opinion of Kassandra (or Alexios). We suspect that selecting the former, cold-hearted comment might’ve put Kassandra in Thaletas’ bad books. Dialogue such as this has little bearing on how the immediate action pans out, but affects social standing in the world at large. It also allows players to role-play how they perceive Kassandra/Alexios would behave in a given situation. It’s an engaging device that doesn’t interfere with how Assassin’s Creed typically works, only previously the attitude was decided entirely by the scriptwriters. Odyssey makes it obvious when certain comments are considered risky, forthright, or just seeking to delay. For example, Kassandra could admit to being a Spartan, or state that she is not, which is flagged as a “lie” in parenthesis. 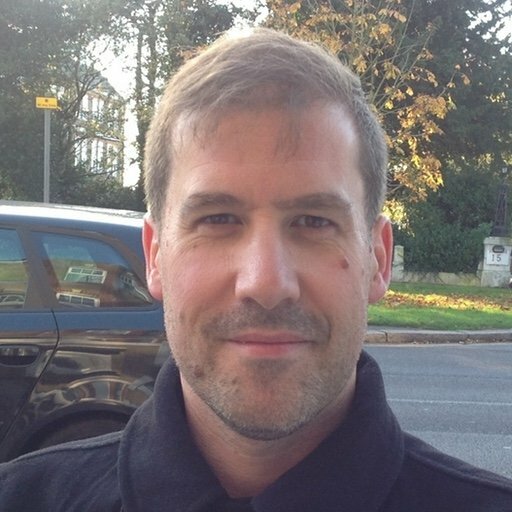 Unlike the award-winning conversation trees developed by BioWare (Mass Effect), and finessed by Arkane Studios (Dishonored), Ubisoft’s dialogue generally presents a one-time only response that closes conversation. We can often ask questions in any order (“Where is Podarkes?, “Weren’t you allies of Athens?”), but these typically have no bearing on outcomes; It’s just toying with the running order of pre-set dialogue. It is apparent — and a good thing in our view — that our avatar is more closely tied to key NPCs throughout missions, serving interests of others as a core element of the main story. Where players would prefer to head off and explore for a while instead of progressing the story, the conversation occasionally has options along the lines of “I’ll come now,” or, “meet you later.” This hold-your-horses function is familiar to anyone who knows Western RPGs. One moment where consequence became clear was in choosing between Kyra or Thaletas with regards to battle tactics. It’s reminiscent of Amita and Sabal in Far Cry 4, whose views on how to conduct affairs as the Golden Path provide hero Ajay Ghale with the occasional dilemma. When it comes to assassinating the Athenian monster Podarkes, Kassandra can side with Kyra (“we should be strategic”), or Thaletas (“we should attack”). We went with Kyra on this one, which may have kindled her flames of passion, though this was purely a gameplay preference. In order to continue with our favored Kassandra persona, we did chastise Kyra with, “I would’ve killed him by now” in answer to her vengeful, “that man’s been hunting me my whole life.” Kassandra could’ve replied, “I’m being hunted too.” But, in our view, this would’ve been weak, and unsupportive. We wanted to challenge the rebels. SPOILER ALERT: The most impressive and emotionally challenging situation involved what at first appeared to be a minor/optional side-quest. A beggar lady requested that Kassandra retrieve a document from a nearby, boarded-up house. Long story short: this revealed that Podarkes was Kyra’s father, and that the beggar was a servant at the time of Kyra’s mother’s murder. It was she that enabled Kyra’s escape. Now, what to do with this knowledge? The assassination of Podarkes was presented as the main mission. He can be killed before informing Kyra, or we can choose to tell her, either in private to honor her dignity (“I should tell you in private”), or in front of her rebels (“Everyone should hear this”), to ensure that the truth does not stand in the way of his demise. We opted to be tactful in breaking the news, but ended Podarkes’ life as originally intended. We don’t know if it is possible to keep Podarkes alive, but later scenes suggested that the game required his death to conclude the quest. Though it was never our intention, Kyra ultimately made a play for Kassandra’s heart, an approach we gratefully accepted. The two spent the night on a beach together, before saying their goodbyes the very next day. During Podarke’s funeral, which Kassandra also conceded to being of importance despite the man’s vile exploits in life, we stayed true to our brash vision of Kassandra and told Kyra that she should now “find a new purpose.” We could’ve been more gentle about it but, what do you know, it was exactly what she wanted to hear. Returning to our ship, Barnabas asked where we should set sail to next. We nudged Kassandra to reply, “to find my family,” steering the narrative to suit our purposes. We could’ve instructed him “to the next cultist,” or simply “to adventure.” Possibly they’re optioned for further down the line. Perhaps these doors are now closed. We won’t know for a while now. These considerations are a factor players have not dealt with directly before in Assassin’s Creed, and contribute welcome layers of intrigue. It adds plenty to the experience, without introducing unwanted baggage for players whose priority is action-oriented goals. The good news is that it feels like it fits the game perfectly. Whether or not consequences remain a permanent fixture in the Assassin’s Creed series beyond Odyssey, that’ll be down to all of us to decide.